The 2013 D2L Ignite Regional User Forum was held in Westminster last Friday, hosted by CU-Boulder. This was the second year of the mini-conference, combining a sprinkling of user sessions with a heavy dose of D2L advertising. And this is referred to as a conference rather than user forum for reasons explain later. The first session attended was a presentation on the use of D2L for non-credit, user group environments by CU Boulder's Aisha Jackson. The session described how CU is handling non-credit group environments, similar to RHCHP's "Info at Your Fingertips". Aisha provided a couple of great ideas for improving this resource while validating the unenroll problem that appears to plague everyone using D2L for non-credit group environments. The session on D2L widgets was standing-room-only so I moseyed over to Debra Warren and Anne Bekoff's (CU-B) session on using D2L as a document repository. A handout provided project management hints while Debra and Anne emphasized how the use of D2L for document collection can greatly assist overworked administrative staff. Word-of-mouth told me that I missed possibly the best session of the conference, hosted by Regis' very own Greg Hatayama. Greg put together the LMS System Administrator Round Table Discussion, a forum for discussing successes and challenges administering the D2L back-end. I heard after-the-fact some very positive feedback on session content as well as Greg's moderation skills. There was spirited discussion centering on chronic D2L support issues. Thankfully, D2L reps were in conspicuous attendance and taking copious notes. -charge a registration fee ($90/head). -have information sessions (20 total). -have keynotes (Barry Dahl, D2L communications manager). -have associated vendor fairs (two vendors plus D2L). -serve fancy lunches (chicken and veggies). -take place in hotels (Westminster Westin). -have banners adorning the conference areas (in ballroom and vendor areas). Conferences place a high emphasis on atmosphere with a conspicuous vendor influence. -charge no registration fees (unless lunch is served). -emphasize discussion on common problems and issues. -begin with a welcome message from a recognized regional leader. -take place at a regional institution. -do not have a vendor presence. Don't get me wrong. Ignite was certainly well organized and hit the mark for a small, regional conference. Kudos to host CU-B for pulling this off. I just think that Ignite misses the point of what constitutes a user forum. I'll be anxiously awaiting the CFP for the 2014 Ignite so that more discussion-centered round tables can be proposed that feature community discussions on user support issues. Let's make Ignite less of a mini-Fusion and more of a user support forum. I went to two sessions at Educause that were on the topic of Badges and Personalized Learning. It was interesting to see how different institutions are incorporating the ideas. In addition we can gain from their "lessons learned." 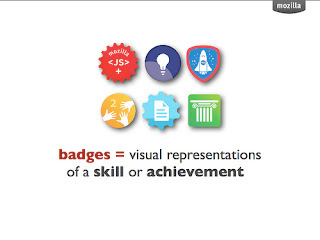 In general, badges for learning are earned as skills are recognized, demonstrated and validated. Northern Arizona is using the concept of badging for personalized learning. They offer high quality degrees at a lower cost than the traditional route but are targeting at students who need a customized approach that wouldn't fit in the "traditional approach." The courses are self-paced and online. The will be assigned a faculty mentor but the course is not set up to be facilitated. The unique feature of this nontraditional approach is that students can start anytime and any day. In other words, it is not tied to a semester or particular calendar. The student takes as long as they need to finish the course. The payment is on a subscription model where for $2500 per 6 month chunks they can take as many courses as they can in that time frame. The entire program in this approach is approved and backed by the Higher Learning Commission. Another unique feature that was worked out with the HLC is that instead of students earning credits the students earn badges for competencies. Now the cool thing about this "outside the box" approach is that if you get aligned with community employers and find out exactly what competencies they are looking for who they hire this can be a direct fit for adults getting the training they need to be 'employable.' In addition, there can be a partnership with the employer and the school for a direct fit. Here is a blog post on the WCET blog by Dr. Fred Hurst on the topic of Personalized Learning. The next session I went to on the topic of badges was from Kyle Bowen from Purdue University. Purdue has rolled out a pilot for badging system for learning. Kyle pointed out that one of the challenges of badging is how to share badges with potential employers. He suggested a Badge portfolio or passport. 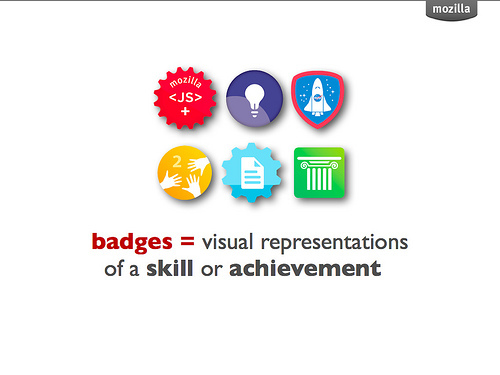 Badges should recognize skills and abilities. Perhaps you can have sets of skill levels such as gold, silver and bronze badges to categorize the extent to which they know a skill. 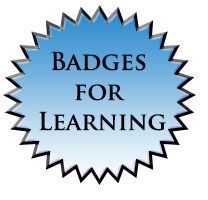 Badges can capture prior learning or prerequisites as well. The folks at Purdue are running pilot and are accepting applications for instructors to participate in order to learn more and experience the badging concept. Go to http://www.itap.purdue.edu/studio/ and then click on "visit the passport studio" to learn more about it.